Charlotte's music scene is constantly inundated with new music -- whether it's studio recordings or collaborative projects and new bands. It's nearly impossible to keep up with, as much as we try. To give a taste of some of the new music that's come out in only the last two months or so, we offer this roundup-of-sorts of albums by Charlotte-area artists which have been released in the early part of this year. We certainly recommend each and all of them, so take a listen when you have a chance. Taylor Centers Gypsy Heart EP (released Jan. 13) — Taylor Centers first caught our ear as one of Charlotte's fastest rising country singers. While early on she was still trying to find her path through pop, rock and soul, her vocal style found a comfortable space within country. Gypsy Heart is her debut EP, though if you keep an eye on her Facebook page, she's constantly running off to Nashville to work on new material. Heart is a solid introduction to her style, vocal range and talent though. "Dodged Your Bullet" sounds like a Southern spin on Nancy Sinatra's "Bang Bang (My Baby Shot Me Down)" offering a lot more attitude and style in a pop approach while "What About Love" takes a more traditional country sound for the ballad. Centers has come a long way since she opened for Kat Dahlia at the Chop Shop in late 2014, and it sounds like she's well on her way down what should be a long musical highway. 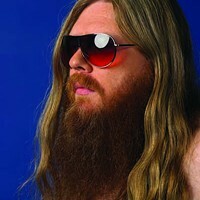 Benji Hughes Songs in the Key of Animals (Jan. 29) — Charlotte's king of the slow jams knows how to have a party. His laid-back demeanor earned heaps of praise on 2008's A Love Extreme, reappeared in a trio of releases in 2014 and returns for his Merge Records debut. Starting with "Peacockin' Party," you get a quick sense of Hughes' ability to write a catchy tune. His vocal tone is often sleepwalking through the music but damn if it doesn't create catchy earworms that stick with you. Animals offers a few collaborations, including vocals from Meshell Ndegeocello. This one, like A Love Extreme, is a double-album, though shorter than its predecessor. Hughes wanted two discs to simulate flipping over a vinyl record. His dry humor is present throughout — "If you show up at Red Lobster lookin' like a lobster, they won't charge you for anything at all." The album's pop sensibilities show Hughes' depth as a songwriter — and a jingle writer, if you "put a little Captain (Morgan) in you" — and one can only hope the streak continues whether his next album is released this year or next decade. Grown Up Avenger Stuff Eclectica (Feb. 19) — Grown Up Avenger Stuff has become a fixture on the Charlotte music scene over the years not only because of their consistency in performing and releasing new material, but because of their support of other local bands. Seriously, the four band members are constantly seen at various venues checking out other musicians. Avenger Stuff's music has always been driven by Tyler Thomsen's heavy-handed drumming and furious guitar riffs of of John Thomsen setting up a backdrop behind the powerful vocals of singer Deirdre Kroener. Eclectica is no different — continuing the trend of '90s inspiration, though with each release the band has consistently improved, not only in instrumentation, but in lyrical content as well. Kroener is getting more poetic with her words and showing more vocal control by balancing the sweeter tones of her voice with her vocal-shredding screams, and it's helping to create some of Avenger Stuff's finest music. From the thunderous opening song, "Brother," to the crushing riffs of "Vision" to the final notes of "Stars," Eclectica might just be the band's best release to date and one of the most solid — start to finish — local hard rock albums I've heard in years. Chuck Johnson and Charlyhorse Barb Wire (Feb. 21) — Americana quintet Chuck Johnson and Charlyhorse formed over the last two years, shortly after a gig opening for Keb' Mo'. The band's music follows a traditional format that's not trying to reinvent the wheel, instead leaning on a sense of familiarity in its presentation. Flashes of piano and electric guitar help to drive songs along from strum-along verses. The band branches out from an Americana label, veering toward rock on the album's opening track, "Birmingham," and leaning toward country on "Elaina." Piano and a B3 organ courtesy of Dennis Johnson help set Charlyhorse apart from the standard fare, as well. Mandolin from Tom Kuhn helps bring an Appalachian feel to "Walk," while "Barb Wire" would fit right in on modern country radio. Jeremiah Wilde Love, Marriage, and Civil War (March 5) — Formed roughly three years ago out of the remnants of Charlotte rock quintet Vess, Jeremiah Wilde features singer Jeremy Vess and guitarist Jeremy Mullis alongside drummer Kevin Dudley, keyboardist Trenton Starnes and bassist Noah Smith. Where Vess played a heavier rock, Jeremiah Wilde strays more into the indie realm inhabited by bands like Modest Mouse — sans quirkiness. Jeremiah Wilde previously released a few singles online, but this is the band's true debut release — a six-song EP that shows promise and experience, especially on the album's standout track, "Gold and Diamonds" which uses funkier rhythms in its structure. KEEP AN EAR OUT: Local rock outfit Black Market is set to release its latest full-length album at a release show at Snug Harbor on March 25; indie duo Bless These Sounds Under the City is currently working on the sophomore followup to its stellar debut album; rock quartet Radio Lola is putting the finishing touches on its debut album; Andy the Doorbum has teamed up with DJ Justin Aswell for a collaborative album that's due out in early spring.